A perfect combination of durability and usability. The simple air piston design is extremely durable even in harsh applications. 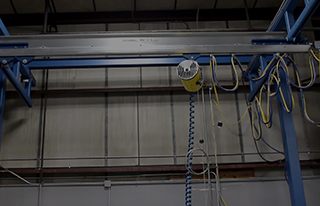 This maintenance free design is also fast, producing speeds up to 200 feet per minute. The lube free design is rated for continuous duty as it runs lube free. 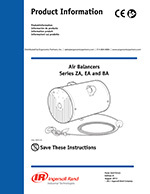 Control Options – ZA CONTROL: pendant or integrated up/down control. B CONTROL: no control package, used when integrated with devices that already have controls. BA CONTROL: For balancing a single, constant load. 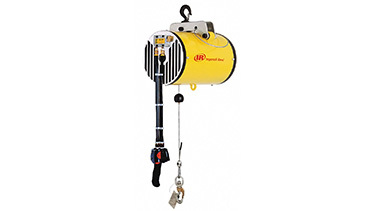 Perfect for tool, weld gun, or fixture suspension where the load is never removed. EA CONTROL: Load balancing for 3 loads - High Load, Low Load, and No Load. Used primarily with Load/no load applications. 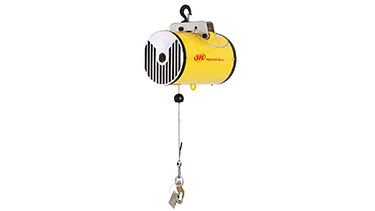 These air balancers require only 1/8 cfm per lift; -on average, this is 50 times less than what it would take to operate a true air hoist. 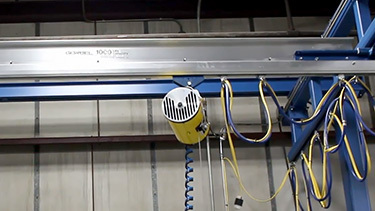 The unit will maintain the load in the suspended position if the air source is ever lost and a spring-loaded centrifugal brake automatically stops the rapid upward cable travel if the lift cable is cut or if the load drops. 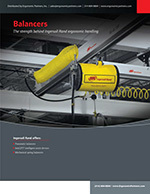 Standard overload protection – As air pressure is used to lift the load, it also limits the overall capacity. This prevents the unit from exceeding the maximum rated capacity. ZAW-015080 150 lbs. 80 in. 50 lbs. ZAW-020120 200 lbs. 120 in. 62 lbs. ZAW-032080S 325 lbs. 80 in. 62 lbs. ZAW-035080 350 lbs. 80 in. 62 lbs. ZAW-050080 500 lbs. 80 in. 110 lbs. 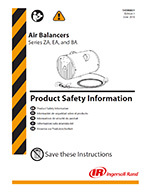 Ergonomic Partners can help with your Zimmerman air balancer application; serving clients from coast to coast, Canada, Mexico and especially focused in the states of Missouri, Illinois, Indiana, Kansas, Arkansas, Mississippi, Nebraska, Tennessee, Kentucky, Iowa, and Oklahoma.